Marx now turns to an important aspect of Ricardo's theory that has relevance to more recent discussion. That is Ricardo's theory of the falling rate of profit. Marx's comments here are preliminary to his further exposition of the flaws in Ricardo's theory of crisis. This has relevance today, because a body of literature has developed around the nature of crises, and the falling rate of profit. I have dealt with this extensively in my book - Marx and Engels' Theories of Crisis. Some of this also has connections to other conceptions of catastrophe related to the environmentalist movement. That is not surprising. A lot of the argumentation about environmental catastrophe, depletion of natural resources, overpopulation and so on, is just a modern retelling of the story set out by Thomas Malthus, in the 19th century. But, Malthus' population theory is also behind Ricardo's own theory of a rising industrial population, rising wages, as a result of more costly food production, and a consequent fall in profits that he feared ultimately leads to the collapse of the system. Much of the argumentation, in recent years, linking The Law of the Tendency for The Rate of Profit to Fall, to such catastrophism and crisis, is actually based upon Ricardo's theory of a falling rate of profit, and not on Marx's theory of that phenomenon, which is, in fact, an outright rejection of both the Malthusian and Ricardian theories. 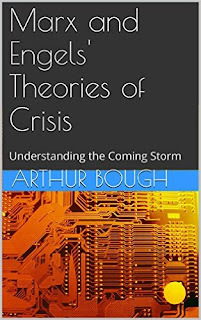 There is a connection between the Ricardian theory of a falling rate of profit, the Smithian theory of falling profits, and crisis; it is the connection that Marx describes in Chapters 6 and 15 of Capital III. That is that crises of overproduction arise not because of the LTRPF, but because, at a given level of technology/rate of surplus value, the mass of surplus value depends on the mass of labour-power simultaneously employed. "Given the necessary means of production, i.e. , a sufficient accumulation of capital, the creation of surplus-value is only limited by the labouring population if the rate of surplus-value, i.e. , the intensity of exploitation, is given; and no other limit but the intensity of exploitation if the labouring population is given." At later stages of the cycle, when capital accumulation has been extended to such a level that existing labour supplies start to get used up, the potential to increase the mass of surplus value becomes harder. Initially, the working-day can be extended without additional wages; then it can only be done by making overtime payments; then this meets physical limits, so additional workers must be employed, such as married women, migrant labour etc. But then it becomes harder to extend the length of the social working day (working day multiplied by the amount of simultaneously employed labour), and so absolute surplus value, and the demand for labour-power pushes up wages, and thereby squeezes surplus value. At the given level of technology/rate of surplus value, it is impossible to raise relative surplus value much, and so a technological revolution is required to replace labour. At a certain point, an increase in capital advanced pushes wages to a level whereby no additional surplus value is produced, or even the mass of surplus value may fall. This latter condition, is actually more closely connected to the Smithian explanation of falling profits than the Ricardian. This is a crisis caused not by a Marxian LTRPF, but by a Smithian profits squeeze, as the rate of surplus value falls, due to rising wages. The solution to the crisis is to address the question of the rate of surplus value. It requires a revolution in the existing technology, so as to increase social productivity. New machines, technologies and techniques are introduced that raise social productivity. A relative surplus population is thereby also created, which drives down wages, reducing the pressure on surplus value. The rise in social productivity reduces the value of wage goods, and thereby wages, raising the rate of surplus value. The new technologies also bring about a moral depreciation of the existing fixed capital stock. By these means, the rate of surplus value is raised, wages are reduced, the value of constant capital is reduced, and the rate of profit is raised. However, this very increase in social productivity, means that although the unit price of materials falls, higher productivity is reflected in a greater mass of material being processed by any given quantity of labour and fixed capital. The proportion of materials in the value of final output, thereby rises, causing a rise in the organic composition of capital, and a fall in the rate of profit.